1. Little things make a difference for different people. Sometimes, these little things go unnoticed. As an example, look at those protrusions on this Jagwire brake pad holder. One wonders what possible use could two shark fin like elements contribute to cycling enjoyment. Well, it turns out that only when you begin to install conventional brake pads do you realize the slight effort needed to hold it in place at the brake bracket while tightening the screw and washer with an Allen key. One of the sillier uses for these little things is that they let you hold on to something to keep the shoe with the pad in place while you're tightening the screw. Some kind of human factors engineering right there. 2. I love my Bell Sweep R helmet. Used for less than a season, I was disappointed when things started falling off its shell as I inspected it this morning. Like this piece of foam! What the hell? Are you kidding me? It has never taken a spill, not even dropped, neither do I have huge ugly fingernails. How can something protect your head by compression when the very thing separates from the shell and falls off to the ground? I truly must admit that I haven't been ridiculously checking every inch of my helmet after every ride, but I figure I must have missed seeing a crack. And the shell-foam bonding has failed here too. While I wonder if I can get away with it and keep riding (I do have another helmet as backup), is there any guarantee that expensive helmets are any safer or better in design? Well... I mentioned in an earlier comment on your blog that I was looking into a new helmet. Considering what's happened... would you get another Bell Sweep R? Also, what did the dealer or shop say about it? I might be off base here but weren't the fins on the brake pads designed to help guide the tire during a quick wheel change. In a rush the tire could come up and if pushed hard enough you could knock the pad out of it's holder. I've seen it done. One forgets to open the caliper but the tire comes out easily when flat. Then in the rush a pumped tire and wheel is put on... you can see where this is going. The fins serve as a heat sink to dissipate the heat from braking and move it away from the rim. Anon : Good point. I missed out on the increase in surface area. Pretty cool. This thing has more than one purpose now. Don : I have contacted Bell. If I remember correctly I bought this off an internet retailer late last year. If I have to drop this helmet, no I wouldn't buy another helmet. I'll just use my old Giro sitting in my closet. Another note about the brake shoes: there are little rubbery knobs on the fins that protrude toward the rim when installed. These function as a bit of a wear indicator as they will rub on most rims when the pad gets excessively worn; making a bit of an odd noise and keeping the metal shoes from digging into your rim and damaging it. As for the helmet - if it's less than one year old, it ought to be under warranty. That shouldn't happen if there was no impact. Contact Bell or a local dealer. At worst you'll get a replacement credit worth a portion of your helmet's value - at best, a new Sweep R! A heat sink? I don't think that there is enough heat flowing through the rubber pads to justify having just a little more surface area from the fins. More heat will be dissipated to the rim which has a very large surface area by comparison. Even if the rims are carbon, the amount of heat going through the brake pad is going to be pretty small. I've always wondered about those fins. I thought of the heat sink explanation too, but I'm dubious about that. Tim: I guess you've never seen or experienced a brake pad melting on a braking surface. Contact Josh as Zipp and he can site numerous instances over the years. A heat sink pulls heat away from not into the thing generating the heat. In addition, the way the "fin" is angled - towards the rear - allows the air flow to help pull the heat away from the rim. Physics 101 my friend. Anon: The rim is going to cool down the most when it is away from the brake pad (a rim is very long, so most of the time it will be cooling down because a brake pad is small). Anyways, a fin would probably only shield the rim from the flowing air for the small % of time it spends at that location. Kind of like riding a bike behind a truck, there is less wind. A rubber brake pad is not a good thermal conductor, therefore it won't transfer a lot of heat to the fin. Almost all of the heat going into the pad won't go past the first millimeter or so, that is why it gets hot enough to melt. Most of the heat will be flowing into the rim, that is why you get glue failures on carbon tubular wheels. The fin was designed to assist in wheel changes. 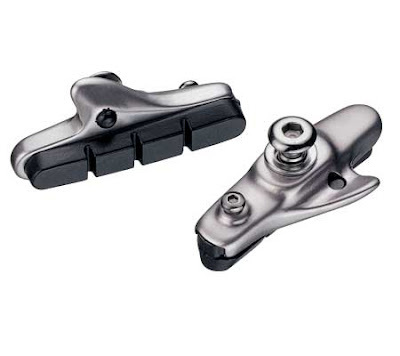 Remember the older Campagnolo and Mavic brake blocks? They had small metal wire "fins" designed to guide the wheel in. Kept riders from banging the brake blocks out of adjustment or, out of the pad holder entirely! Same thing happened to my bell sweep exactly. I dont think its unsafe since I doubt I'll ever crash on just the back of my head, but its certainly something Bell should be aware of and fixing in their next release. Delta : Thank you! I feel glad I'm not alone. Where exactly did the foam detach on your helmet? Do you have any pictures? Having gone over the bars going about 35 and breaking a Bell SweepR I can say it is what has allowed me to type this. It did a great job! Bell has a replacement policy where they replaced it for $30 with an identical model. You might want to check with their warranty people. I always go directly to the manufacture on warranty items and get a better response. Bell used to have a $30 crash replacement policy, that is. Since they were absorbed into Easton Sports (same parent company as Giro), they shifted to Giro's policy, which is something like 30% off of retail for crash replacements. That's something, but is still more than you'd pay for a new one if you bargain hunt a bit online. Bell "grandfathered" in my '06 Sweep R after a crash last summer and sent me a new one for $30, but they said that for '07 and later they no longer offered that. I do love that helmet though, and I may well owe my life to it as well. That said, sounds like you guys are experiencing manufacturing defects, so the crash replacement policy probably has nothing to do with it. Good luck. WOW After I sent my post I went out and looked at my helmet and if it wasn't white and silver I would think the pictures are of my replacement helmet. It is missing the exact same piece. I would think that this is a manufacturing defect since it seems to be common and at the same location on the helmet. The helmet they did the $30 replacement on was a 07 model and I think the book that came with it stated the $30 policy. Bell has replied to my email about this problem. They said they're willing to "inspect" it if I sent it to them with a certain ID number they provide. I wonder how much "inspect" will do but its a start. Dude! That helmet! So it just has little bits that stick off, unsupported and apparently offering no actual protection-- except to your coolness. So that US$30 Bell helmet meets the same standards as the US$200 lid. Furthermore, since there is less helmet, less "stuff" in the expensive lid, it must be made of harder material. The metal head-form used in testing doesn't notice that, but your soft meat-head will! Annnnd another thing: Why is it that most helmets are made in China these days but the prices don't reflect the cheaper manufacturing costs? Manufacturing is cheaper overseas, but liability can't be outsourced. More expensive helmets are (generally) cooler and lighter than the less expensive. I'm not sure how to answer the price question but I bet the companies pack enough money in these helmets to keep them 'safe' when sued.. I can't believe actual design of the helmet costs so much. I'm not ready to put any flower pot on my head. Having said that, the trend for ever lighter helmets with vents everywhere u can think of scares me. Ron, remember also that the price of goods is not entirely dependent on the cost of production. Giro can charge over $200 for some of their helmets because that's what consumers are willing to pay for them. I'm certain they have healthy margins on their more expensive helmets even with the carbon fiber reinforcement in them. Right and right. Kind of like over priced Colnago's. Someone will pay for that all the Euroness. As we know that BMW brake pads generate a lot of dust and grime which requires wash of BMW once a week. Aftermarkets introduce alternative which produce less dust and grime and this was overcome the dust but create another problem which was very noisy.